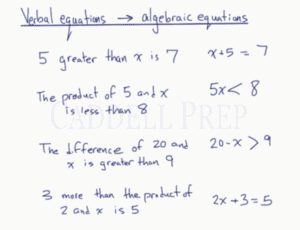 In this video, we are going to learn how to turn verbal expressions and equations into algebraic expressions and equations. When turning expressions into mathematical expressions, we use keywords to determine the operation that should be used. Specific keywords or phrases in the verbal expression allows us to also determine the order of numbers and variables, “greater than”, “less than”, and “difference of”. 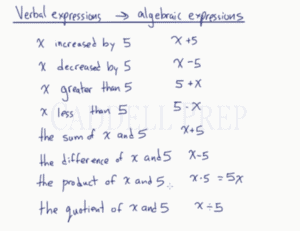 Let’s go over changing verbal expression into algebraic expressions. increased by this will be . decreased by since it’s a decrease, we are taking away from . So this becomes . greater than , here we have more than . We have and we’re increasing it by . Here we have . less than . So think about this, if we have less than . We have and we’re taking away from it. So it’s . The sum of and is just . The difference of and , difference is the answer to subtraction so we have is . Then the product of and would be which we know is . The order isn’t important in multiplication and addition. The quotient of and , since quotient is the answer to division our answer would be . You should get familiar with these different expressions. Some may memorize these. But it’s nice to look at these expressions and make sense of it. Now, let’s look at changing verbal equations to algebraic equations. Verbal equations are expressions that have equal signs. So, we’re going to do this in equality. Like equal to, less than, greater than, less than or equal to, or greater than or equal to. The product of and is less than . The difference of and is greater than . more than the product of and is . While is less than is . “Is” in the sentence is an equality sign. That’s why we come up with the less than sign.